The market’s presentation was pristine. Bouquets of flowers were interspersed between bottles of bubbly. 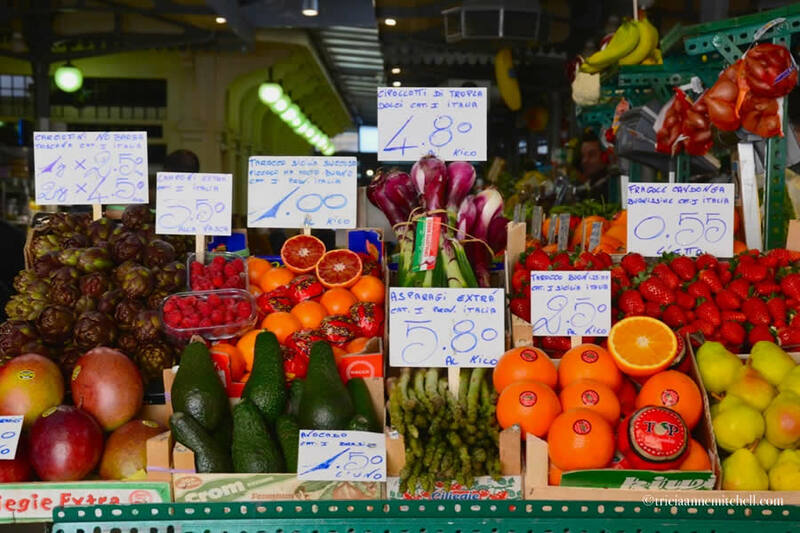 Hand-lettered price tags showcased fanciful flourishes, and stands brimmed with beautifully-arranged mounds of hand-made pasta, vibrant fruits and vegetables, and countless types of cheese. 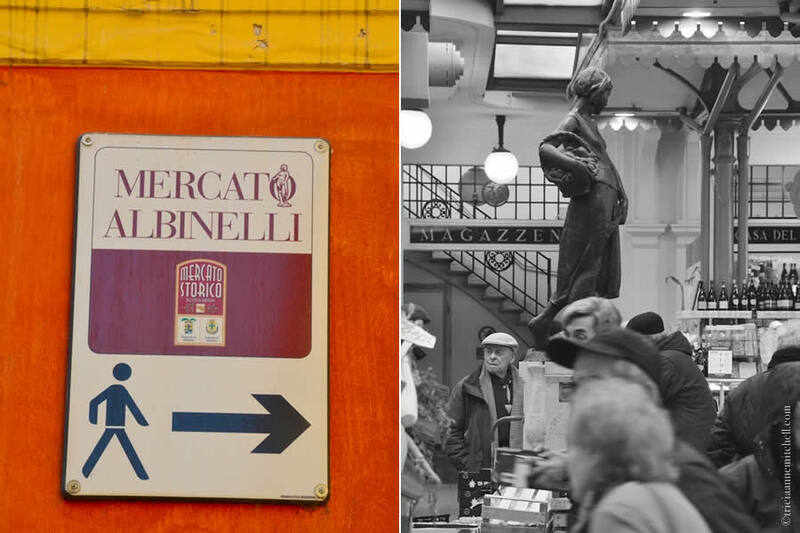 Opened in 1931, the Mercato Albinelli is itself a work of art. From rod-iron trimmings, to a statue of a young girl with a basket on her hip, the market’s offerings are all just a moment’s walk from the city’s main square, the Piazza Grande. Lovely black & white imagery from the 1930s shows that while its presentation may have changed, the market has retained its classic charm. 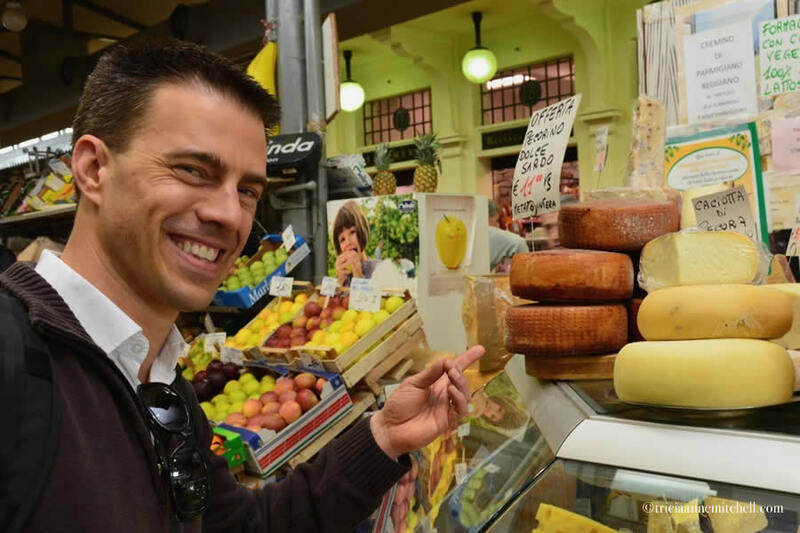 It’s a testament to the Slow Food Movement that was born in Italy, and a must-savor experience when in Modena. 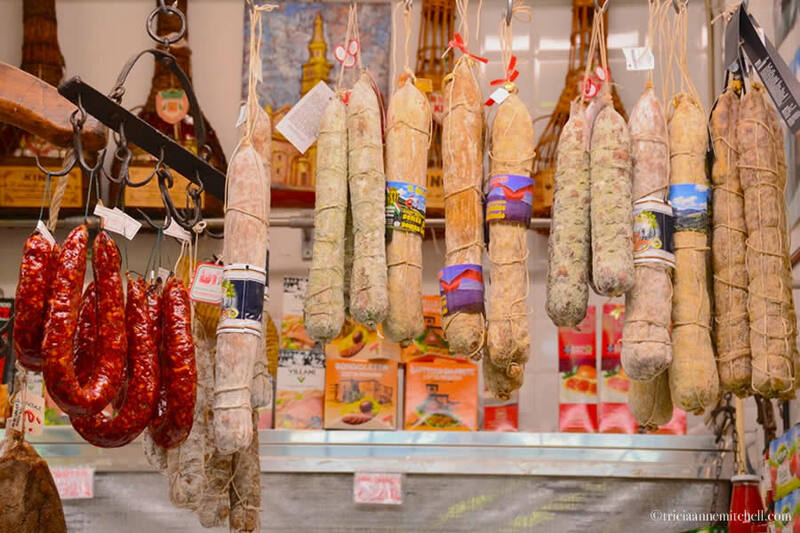 Do you have a favorite market that you’ve savored at home or during your travels? Please share the details in the comments below. 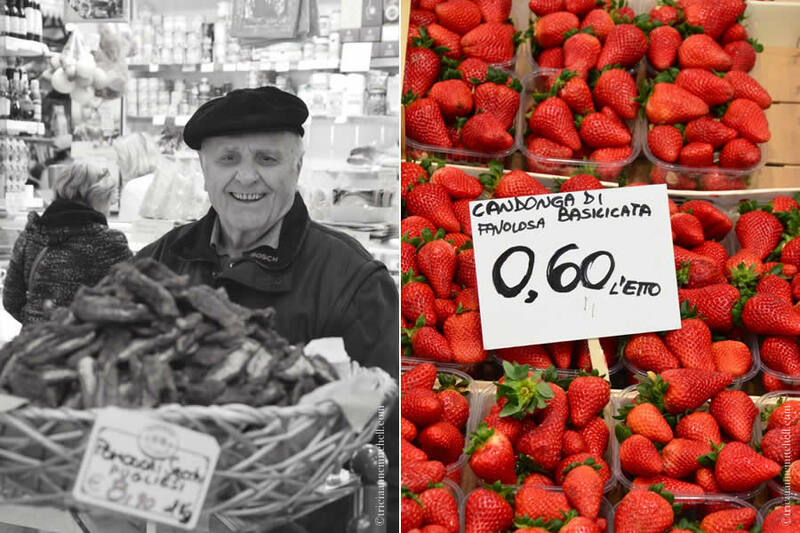 Plump, luscious strawberries, known in Italian as fragole. We picked up a few hundred grams and enjoyed them during a picnic. 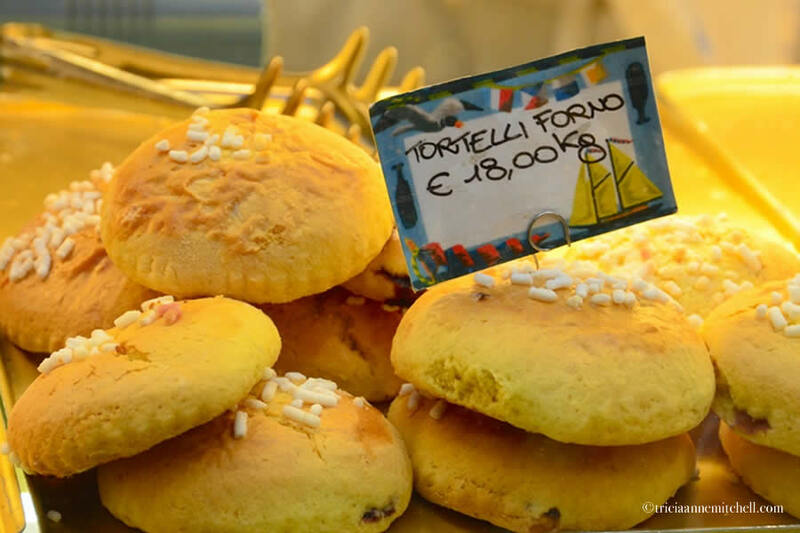 They were .60 Euro cents per 100 grams, or etto. 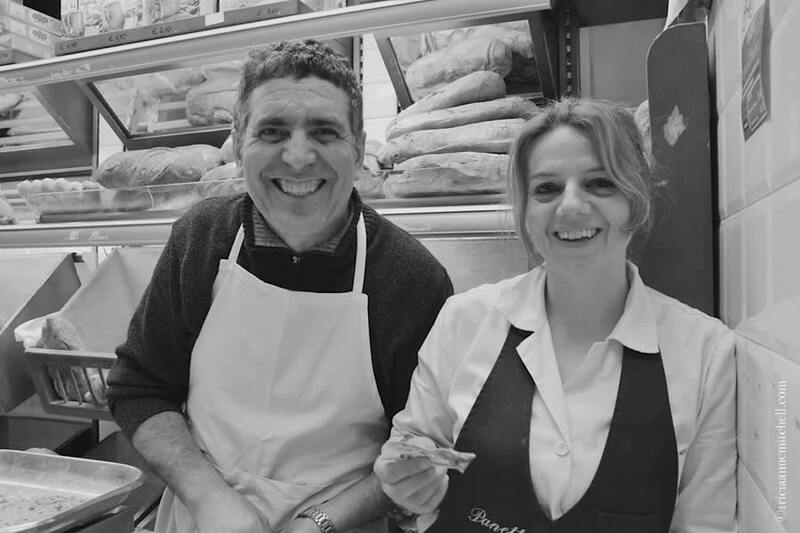 Wide grins at Enzo’s Panetteria (bakery). Enzo was such a friendly fellow, instantly welcoming Shawn to the market by giving him a complimentary Tortelli Forno sweet treat. It’s no surprise that we returned the next day so that Shawn could buy some bread from Enzo. 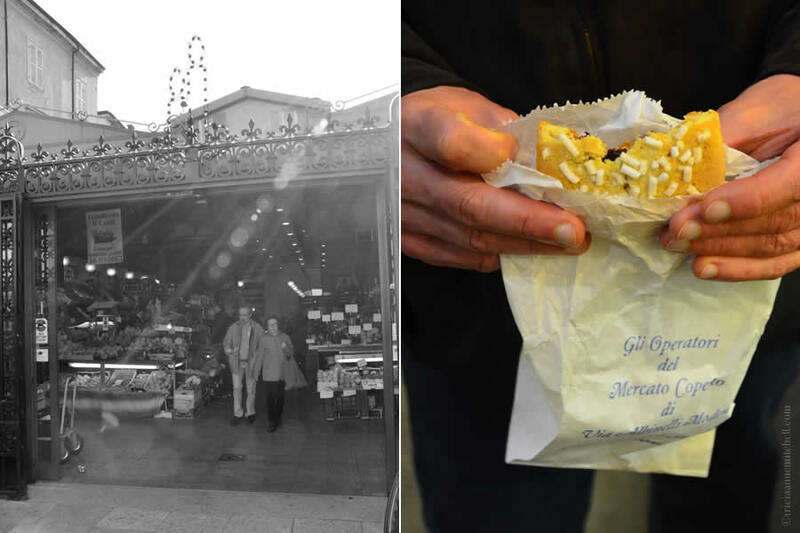 The entrance to the market and the remains of Shawn’s much-enjoyed Tortelli Forno treat. 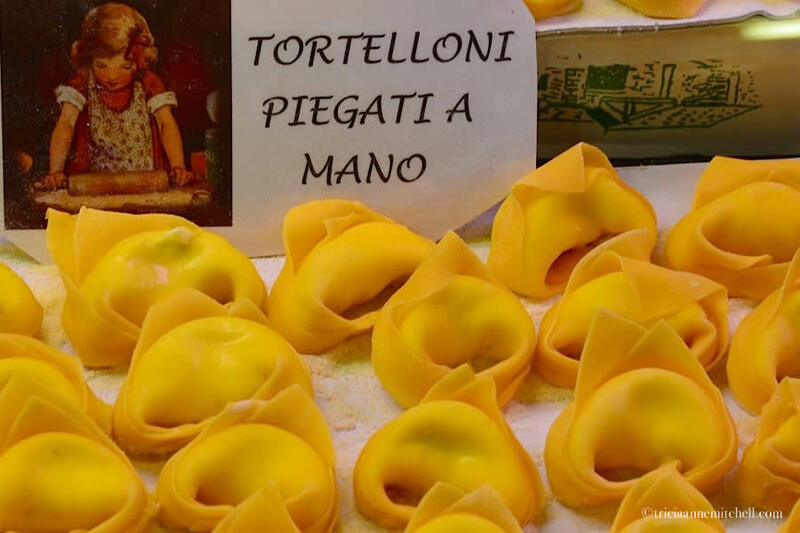 Hand-made perfection: A tray of tortelloni, nicknamed the belly button or ombelico pasta. Tortelloni originate from Emilia, Italy. I was trying to unobtrusively snap this basket of overflowing sun-dried tomatoes when the gentleman in the background playfully pointed to himself, insisting that he be included in the frame. The friendly shopper told us that he was in his 90s. 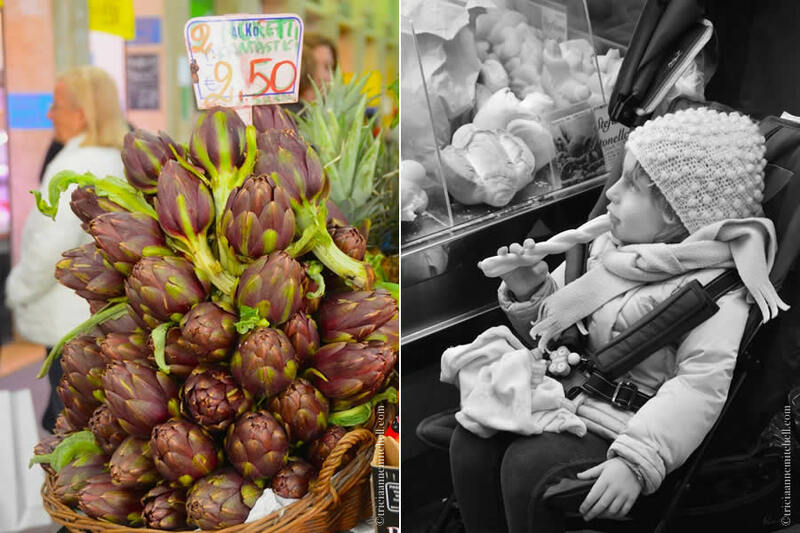 Beautiful artichokes (carciofi) and further evidence that Modena’s market vendors are incredibly adept at the art of sales. I think almost every child I spotted was holding a complimentary twisted bread stick or crispy breadroll in their hand. 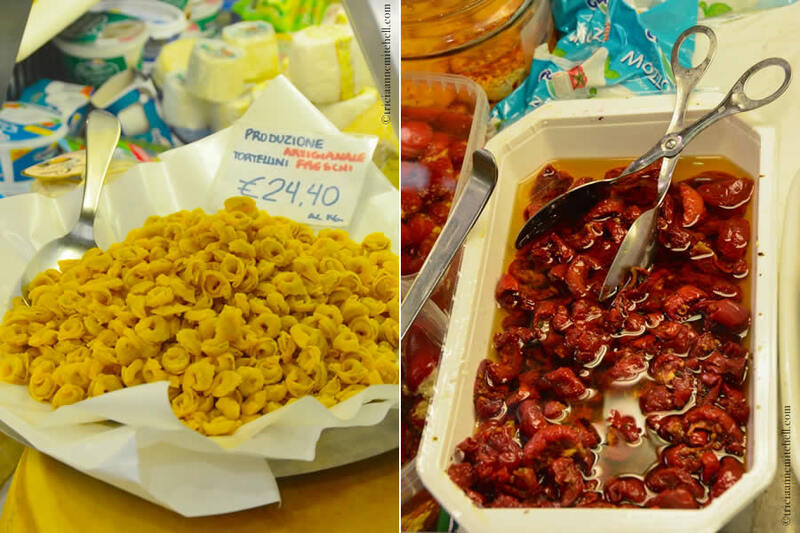 Homemade tortellini and brilliant-red, sun-dried tomatoes swimming in olive oil. With wide grins on our faces we watched as this dog enthusiastically pulled in the direction of this flower stand. He was especially smitten with these yellow blooms. 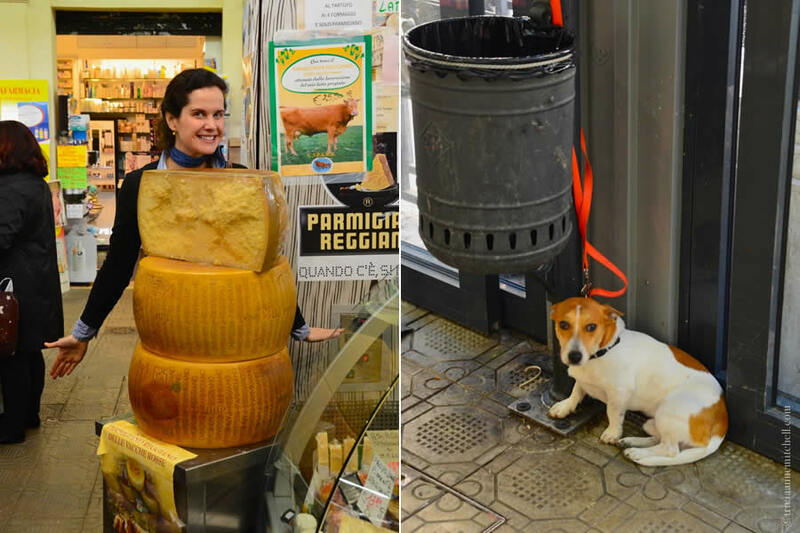 My version of a Parmigiano-Reggiano snow woman, and a timid dog awaiting his owner by the market’s entrance. Each cheese wheel weighs about 38 kg (roughly 80 pounds). 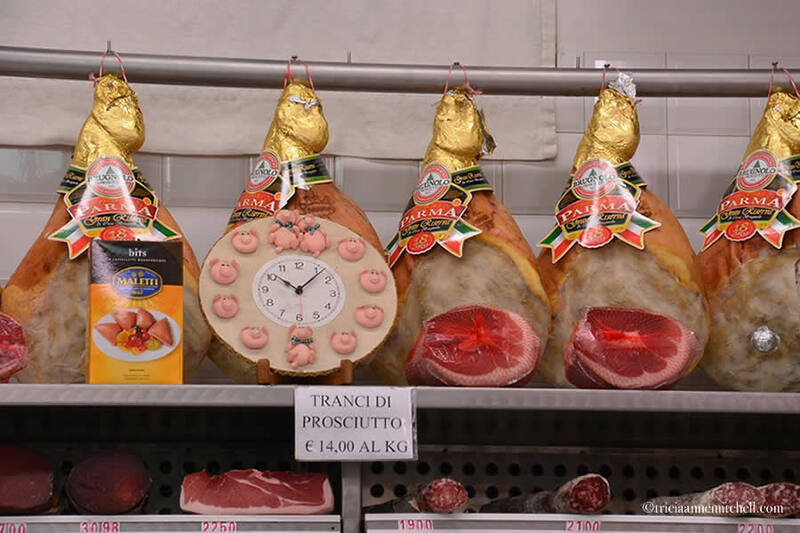 Prosciutto (dry-cured ham) from the nearby city of Parma. 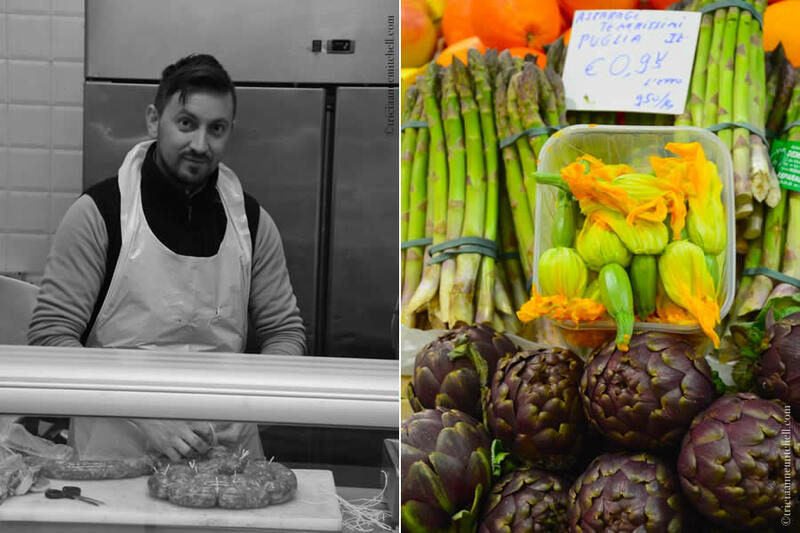 A butcher puts the finishing touches on sausage links; and artichokes, asparagus, and golden zucchini flowers mingle. 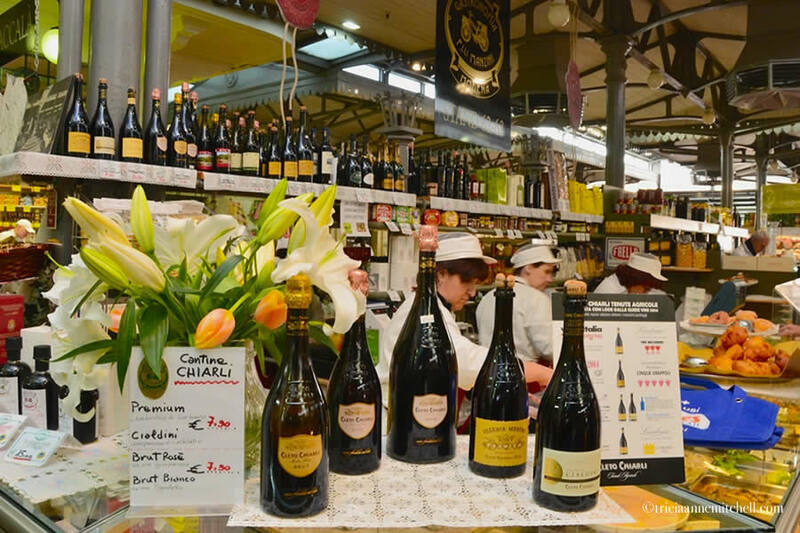 The Albinelli Market is located at Via Luigi Albinelli, 13, just a moment’s walk from Modena’s main square, the Piazza Grande. Check the market’s official website for opening hours and a handy map which shows where the various categories of culinary goodies can be found. I was delighted that there is even a stall devoted to gluten-free pasta and bread. Look for the stall #29 and the name Senza Glutine (without gluten). We spent 3 nights at the elegant, historic, and centrally-located Hotel Canalgrande (affiliate link). One of our favorite memories from Modena, in fact, was sitting out on our hotel room balcony just before sunset, looking out over Modena’s rooftops, while enjoying goodies that we’d procured at the Albinelli Market earlier in the day. The food looks incredible. I can’t wait to get to Italy and try some of this for myself. Juliann, the quality of the food at this market was so impressive that we visited it three times in three days. Since we didn’t have a kitchen, we opted for picnic treats. Do you have a trip to Italy in the works? Gorgeous photos of such a beautiful place. Virginia, that makes two of us! Alas, since we didn’t have a kitchen in which to do most of these ingredients justice, we focused on picnic treats – strawberries & balsamic vinegar, a peppery, Sicilian cheese; a crispy baguette, Pesto Genovese, and some sweet pastries for Shawn. No wonder why the residents of this town seemed to exude such happiness! Oh Joy! Thou name is picnic!! MM, I’m glad the photo essay was effective in tempting your tastebuds. 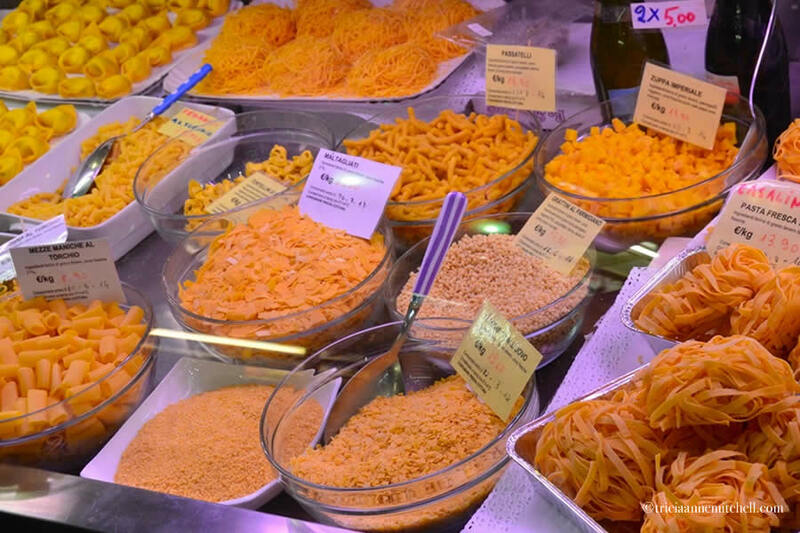 :-) Undoubtedly, you’d find a lot of inspiration for your sketchbook with all the different pasta varieties! Oh, these foods look so delicious! Italy is such a wonderful place, isn’t it? Anda, it is, and we’ve only scratched the surface. Having previously focused on the usual suspects (Rome, Florence, Venice, etc.) it was a joy to have a peek at Emilia-Romagna. There’s much to call us back! 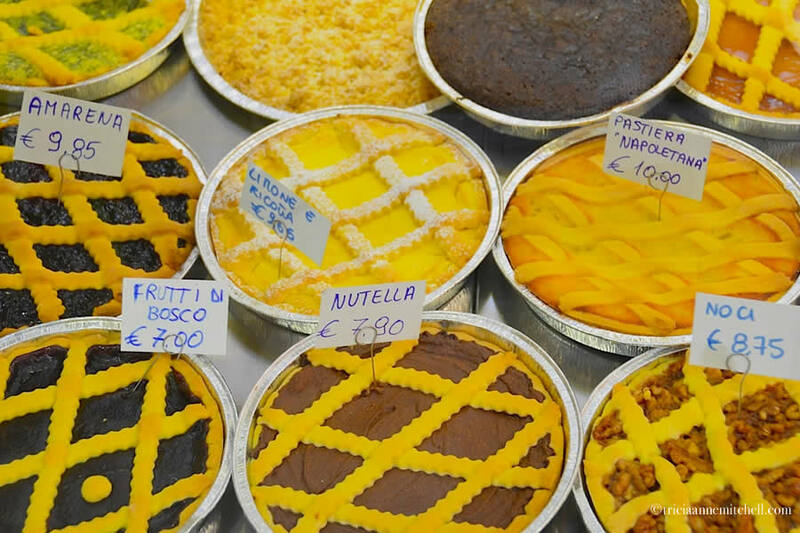 What are your personal favorites in Italy? Farmer’s markets are the best places to wander, to meet locals, and get free tastings! We used to love heading to the Cours Saleya while we were in Nice, France. Besides all the fresh fruits and vegetables they also have gorgeous flower markets there. Bespoke Traveler, I think I might have stopped by that same market when I was in Nice in July of 2003 or 2004… I left it, or one of the markets along the Côte d’Azur, with a sizable bouquet of lavender, which provided a wonderful aroma on our train ride back home. :) Did you previously live in Nice? :D I wish! No, just visited the lovely place for awhile. 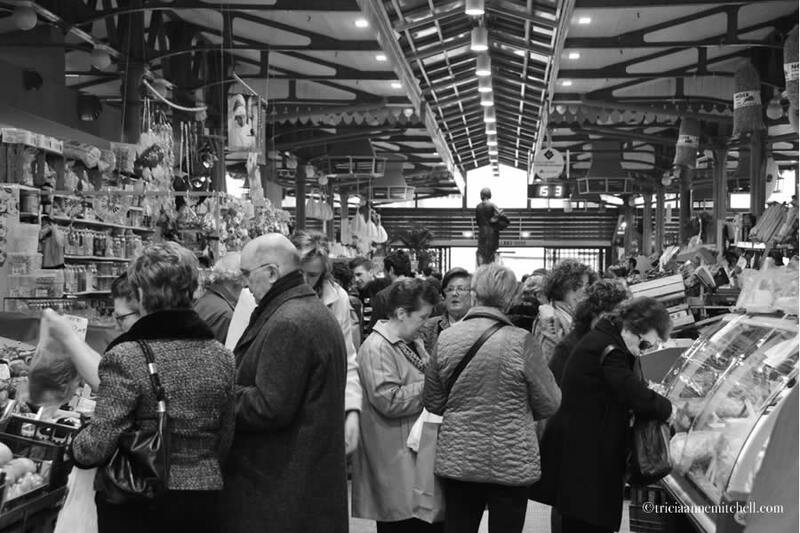 Il mercato Albinelli e’ come la tavolozza del pittore……e’ una gioia per lo spirito visitarlo…. Ti riempie il cuore e la mente di bellezza e serenità . Ciao Carla, e grazie per il tuo commento. “Come la tavolozza del pittore” – mi piace. 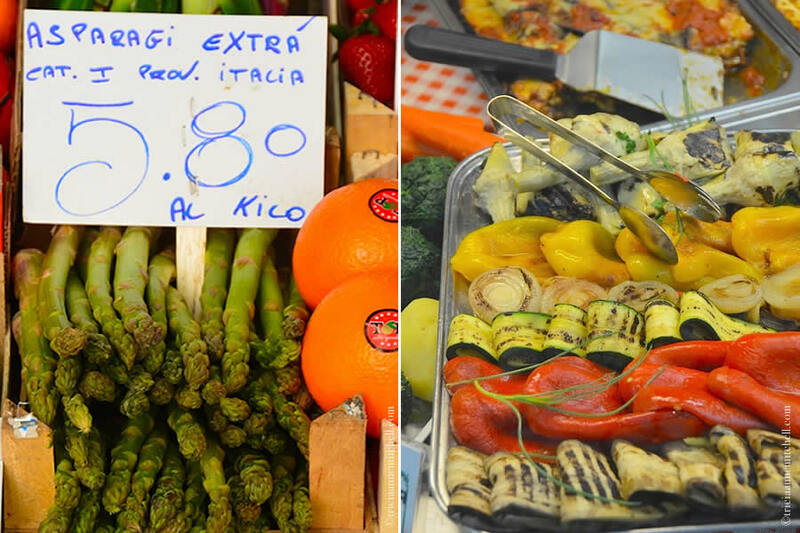 European markets are a feast for the senses with all the colourful vegetables and the salamis and cheeses. Dorothy, they absolutely are. 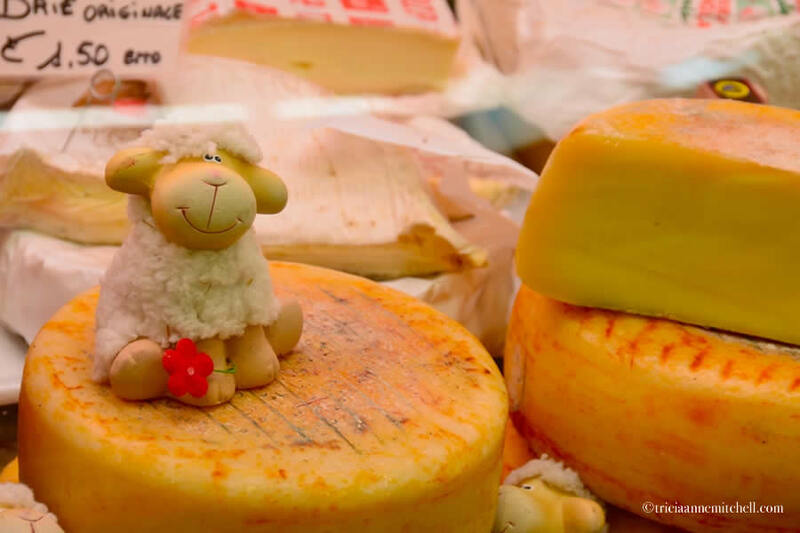 The selection of cheese alone at the Modena market could have held my attention for a long time. Are there certain European markets that have been especially memorable to you? I’ve also immensely enjoyed Santiago de Compostela’s in Spain, as well as Budapest’s. How gorgeous is all this fresh food. I love the colours. 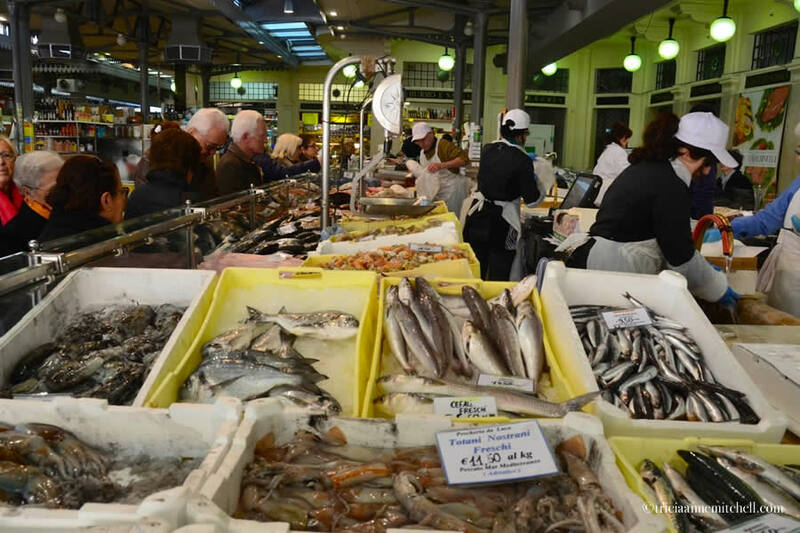 Carol, the quality of the food that we purchased was just as good as this market’s pristine presentation. 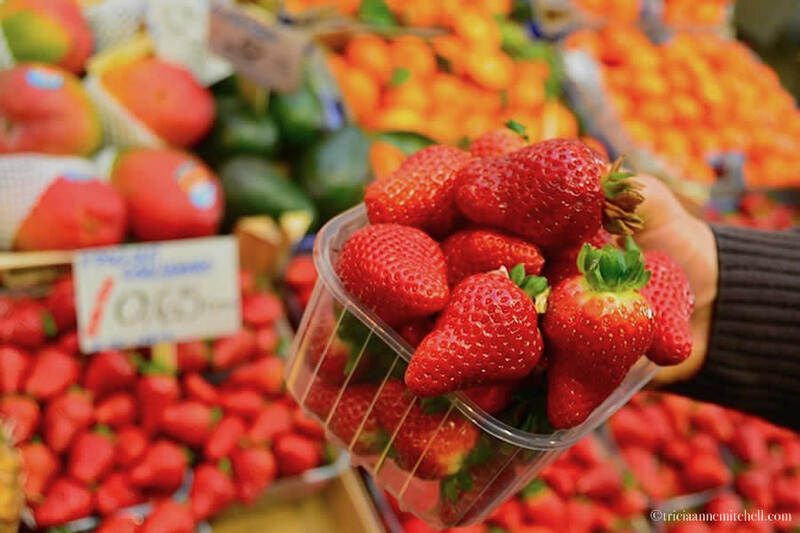 Does your part of Australia have an abundance of fresh, farmers’ markets too? There are some, but distances prevent farmers from travelling. 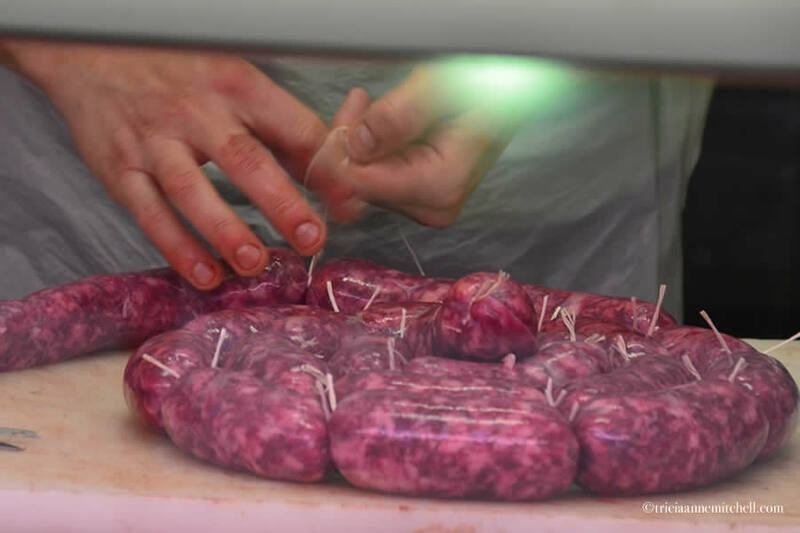 I went to an excellent market in Brisbane recently and the food was amazing. Ruth, the dog ‘taking time to smell the flowers’ brought a smile to my face that morning. Actually, the smile never really left because we kept getting engaged by passersby, and the mood was so cheerful. I’m guessing you had the same type of experience in Alberobello. I think it was your post of Alberobello that introduced me to the town, and made me want to go there. It’s the one with the trulli buildings, right? This is a silly question perhaps, but were the market’s stalls housed in similar structures? love the pics and details! 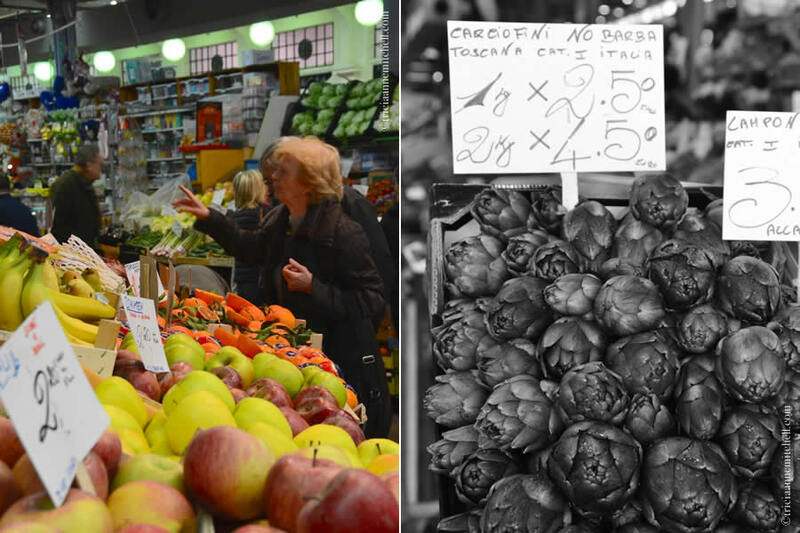 Melanie, glad you enjoyed the virtual visit to Modena’s incredible market. Will you be heading to that part of Italy soon? but maybe one day if/when i go back to italy, i’ll make a stop there! didn’t even know about it! that sounds really good right about now! 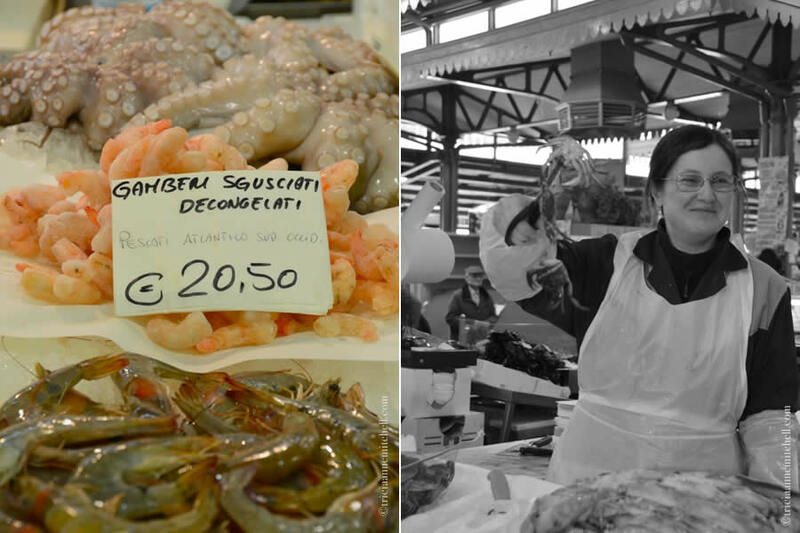 Stefania, the Mercato Albinelli was indeed one of our favorite experiences in Modena. 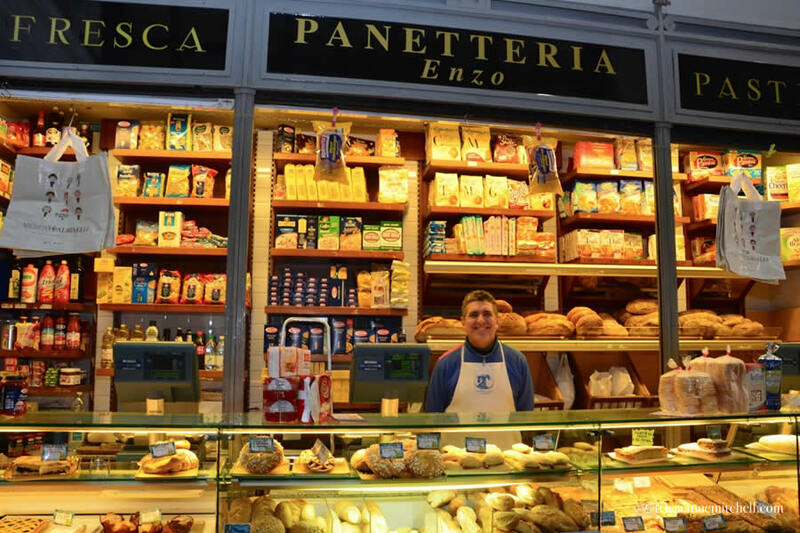 Since you go there rather regularly, please tell Enzo (at the panetteria of the same name) hello. My husband, Shawn, still thinks about the Tortelli Forno from his shop!